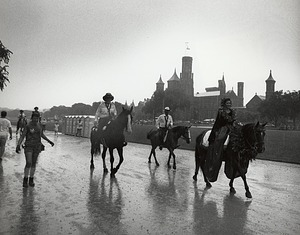 Folklife presentation, education, and research began at the Smithsonian Institution in 1967 with the first annual Festival of American Folklife held on the National Mall. To this day, the festival features performers, crafts people, and community groups from the United States and foreign countries. The festival was started by folklorist Ralph C. Rinzler (1934-1994). 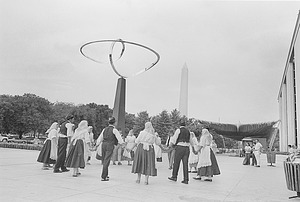 Originally part of the Smithsonian’s Division of Performing Arts, a separate Office of Folklife Programs was created in 1980. In 1987, the office purchased the Folkways music collection which became the core of the Ralph Rinzler Folklife Archives and Collections, a rich resource for the study of folk culture and music. 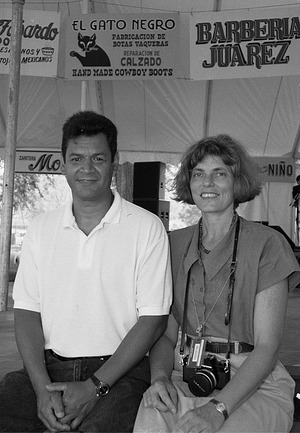 In 1998, the Festival was renamed the Smithsonian Folklife Festival to reflect its international interests, and in 1999 the office was renamed the Center for Folklife and Cultural Heritage to reflect its research, as well as public program functions. A participant works on a quilt at the 1968 Festival of American Folklife on the National Mall, Washington, D.C.
Yugoslav dancers rehearse on the South Terrace of the National Museum of History and Technology, now the National Museum of American History, before their performance at the seventh annual Festival of American Folklife, June 30 - July 8, 1973. Behind the dancers is the sculpture "Infinity." The Washington Monument can be seen in the distance. 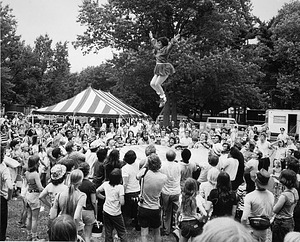 At the July 3-14, 1974 Festival of American Folklife, Native Americans section, a woman participates in the blanket toss, a game in the World Eskimo Olympics. 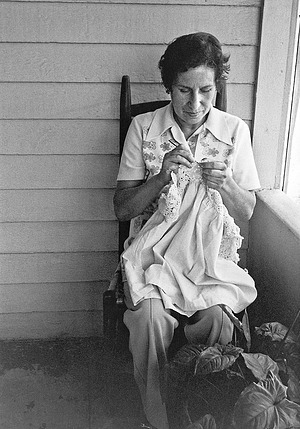 Julia Lopez, a needle craft artist from California, demonstrates Mexican stitchery at the 1978 Festival of American Folklife. 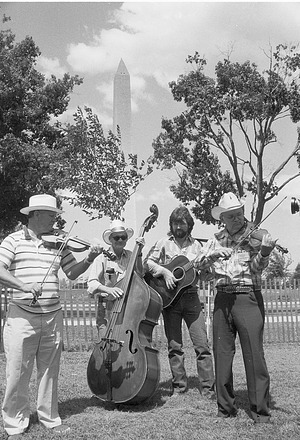 At the 1985 Festival of American Folklife, the Hayride String Band performs. The Washington Monument is visible in the background. 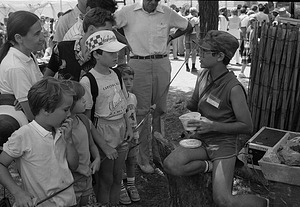 Junior volunteer John McCauley demonstrates marblemaking to onlookers at the 20th Festival of American Folklife, in the Summer of 1986. 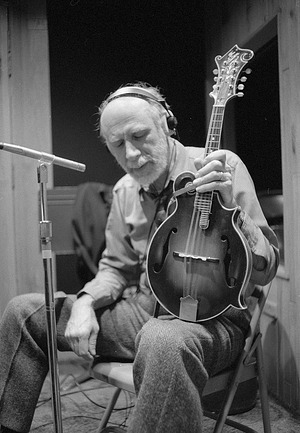 Ralph Rinzler listens through headphones during the 1988 recording session for the album "Folkways: A Vision Shared." Ralph Carter Rinzler, 59, was former Assistant Secretary for Public Service and founding Director of the Festival of American Folklife. Hawaii was the featured state in the 1989 Folklife Festival from June 23 - July 4. Hawaiian participants are seen here riding a the downpour in a traditional Pa'u parade. Taquile musicians from Peru perform in the "Land in Native American Cultures" program at the 1991 Festival of American Folklife held on the National Mall, Washington, D.C. Painters Rolando Mayen and Paula Kaufman in the Office of Exhibits Central's Graphics Department created these authentic commercial signs for the music tent in the Borderlands' program at the 1993 Festival of American Folklife. A Lithuanian blacksmith demonstrates his skills in the Baltic Nations program during the 1998 Smithsonian Folklife Festival. An aerial shot of the 1999 Smithsonian Folklife Festival, showing the site of the South Africa program. The Dalai Lama, 2000 Smithsonian Folklife Festival. Visitors at the 2002 Smithsonian Folklife Festival. Visitors enjoy the 2004 Smithsonian Folklife Festival on the National Mall. At the 2007 Smithsonian Folklife Festival, visitors admire the Pakistani hand-painted truck originally brought to the Smithsonian for the 2002 Folklife Festival.